Estee Lauder Double Wear Stay-In-Place Makeup SPF 10 available for Rs 2,790/30 ml, across Estee Lauder Counters. #1 product in foundation in 2012*. 15-hour staying power. Flawless all day. Glides smoothly and absorbs oil. Won’t change colour, smudge or come off on clothes. For a really long time, I had trouble finding a good foundation that matched my skin (type, shade and undertone) perfectly. I liked my Studio Fix Powder, but somehow after using it for about a year, I one day realized it was just not working for me anymore because my skin’s texture and moisture composition were changing. For reference, I have Combination to Oily Skin in Summers and Combination-Normal in winters with a few dry patches here and there and a few acne during “that” time of the month. It is a very complicated skin type , I thought, and was desperately looking for a foundation that would take care of the flaws, give me enough coverage, last long, not look artificial, feel light on my skin and not clog my pores. I had zeroed in on 2 foundations: Estee’s Double Wear Foundation and Make Up For Ever HD Foundation. One day while scrolling past the Estee store, I just decided that I wanted to try Double Wear on my face before I bought it, and I was matched to Shade 4N1 Shell Beige and as soon as the SA started applying it on my face, I just knew this was perfect. When I saw the radiance on the one half of my face on the side where the SA had applied the foundation versus the side which had Studio Fix on, I made up my mind, and since that day, I’ve changed the way I look at foundations! Estee Lauder Double Wear Stay-In-Place Makeup SPF 10 comes in a cuboidal Glass bottle inside a metallic Navy Carton with a Golden Screw Top Lid. The packaging would’ve been quite ordinary but the Golden lettering gives the foundation bottle a very classy and vintage feel to it. I like the bottle like this , but I’m sure a lot of people would prefer a foundation with a pump for more hygiene. Also if the bottle topples inside your makeup drawer, the cap might become messy. And since it’s a glass bottle, it’s definitely not travel friendly. 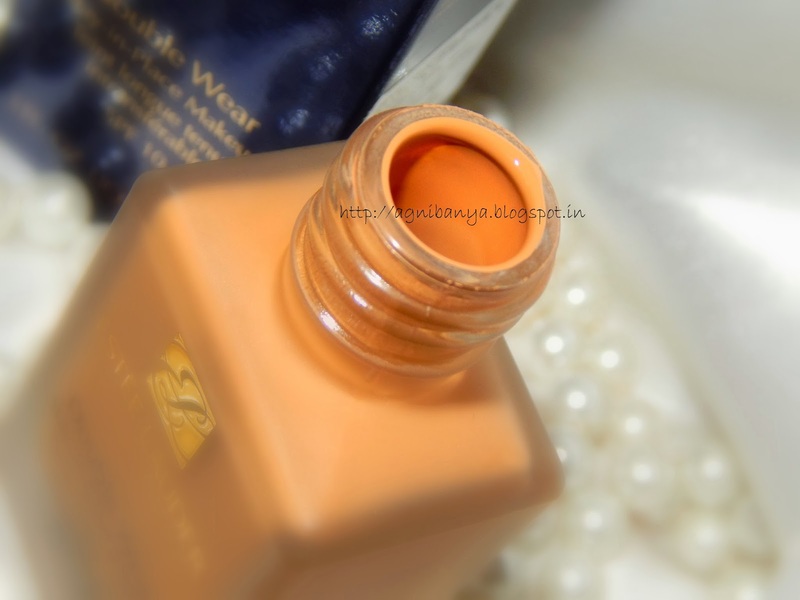 The texture of the foundation is light and watery, and although the name “Double Wear” might perhaps suggest otherwise(read creamy, thick, gloppy etc etc)). I always use a primer under all my foundations, and this foundation, over a primer, is absolutely a delight to work with because it just blends in so easily. It dries quite fast because of the watery formula so you must be quick while blending. I use my regular The Body Shop Foundation Brush to apply it because it gives the best application in my case. Alternatively, you may use your fingers too. The foundation might emphasize on the dry areas of the face, which was my biggest concern while buying this foundation, so I was suggested by the Store Assistant to properly moisturize my face before using this foundation, and that helps for sure. Also, I must mention here, that using this foundation on a regular basis might not be a good idea since it’s drying. In my case, if I use the foundation for two days continuously, the dry areas on my face become worse,and on rare occasions I also get dry acne, so you have to be cautious on that part. The finish is not completely matte, but satiny, and I can see a soft radiant glow on my face post blending.That being said, I must tell you, it keeps oil at bay, and on my combination skin, I haven’t ever had the need to use a powder/compact on top of this foundation at all. It lasts easily for more than 10+ hours, and holds other makeup, like blushes and highlighters perfectly for that time too. It does not fade, or oxidize, or transfer to clothes etc. the foundation comes with SPF 10, but still photographs beautifully. The coverage is medium, but it can be built up. I usually avoid doing that though! Although the foundation claims to be fragrance free but if you sniff right on the bottle opening, I can detect a slight cosmetic scent, which is not detectable while application or during wear. The Estee Lauder Double Wear Stay-in-Place Makeup SPF 10 is an excellent long wearing makeup that last for more than 10+ hours. It comes in a glass bottle with a screw top lid which is not travel friendly.It has medium to buildable coverage and gives a satiny finish without making the face look too flat or matte. It also acts as an excellent base to other makeup like highlighters and blushes on the face. It also photographs beautifully but since continuous usage might leave your skin dry, I recommend using it only occasionally. Although, on the pack it mentions the foundation being meant for “All skin types”, I’d say it is ideal only for Combination to Oily skin types. Thanks Tanmayee..But the quality totally justifies the price..It's an excellent foundation..even calling it excellent is an understatement…. I have this and i totally love it…one of the best foundation! do u think it will work for dry skin too.. ?? Hi Poonam,thanks.. I mentioned in the review. I won't recommend this foundation this for dry skin..its ideal for oily-combination skin. this is my all time favorite foundation. Its great Parita,go for it….and if your skin is like mine, you would totally enjoy using this one..
Hey, what shade were you using on MAC Studio Fix?